A fantastic addition to our handmade range of furniture; this beautiful hand crafted reclaimed rustic pine console table features traditional period styling. It is created with a reclaimed pine top, and features a classic and rustic appearance. 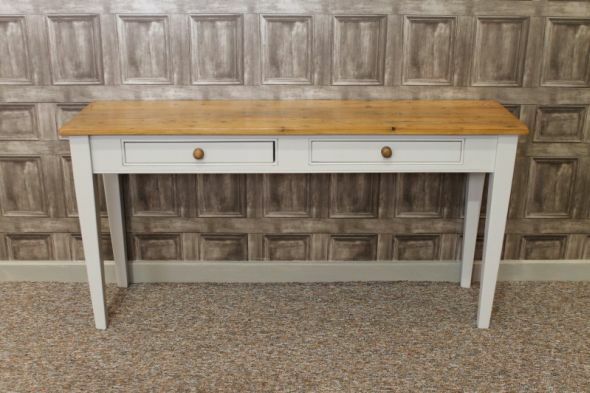 With its beautifully painted base; complete with two storage drawers, this rustic pine console table would make a great focal point in any pub, bar, restaurant, cafe, or home. This reclaimed rustic pine console table is a set size and a set price. This is the only size available for the special price of £265.00 (each), and we have a limited quantity available. This side table can be painted in any of the Farrow & Ball paint colours at no additional cost. Please note – these are handmade pieces of furniture, and may not be available for immediate despatch. When placing your order, please expect there to be a lead time of approximately 3-4 weeks due to personal item specification. This item is now sold.